An exemplary collection of short stories which matches Trevor's last (The Day We All Got Drunk on Cake, 1968) in the efficient delicacy with which he pinpricks moments of resignation in unprepossessing lives. Trevor's people -- small town and rural Irish, middle and lower-middle class English -- are unremarkable, passive, endowed as children with a certain canny awareness of adult illusion. Parents, lonely and helpless, or trapped into meaningless rituals, take their toll of the young. 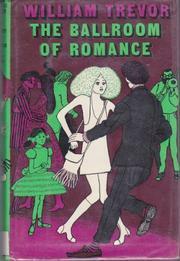 In the fine title story, a thirtyish unmarried "girl," who lives with her crippled father, pays her weekly obeisance to dreams that once had the possibility of fulfillment -- as she bicycles to a roadside dance hall, the "Ballroom of Romance," a burst of lights and sedate jazz, a Saturday night chimera. But the time to dance soon ends and the future is a dark landscape where one knows all the roads. A young girl, observing local sexual mores and her parents' rootless lives, plans for an antiseptic spinsterhood. A teen-age boy, whose sexual fantasies are articulated by an unbalanced elderly dwarf, penetrates the "lies" of the adults around him and chooses a solitary release. In other stories, alcohol, drugs and confessional torrents offer momentary refuges without exits. The most insidious story is "O Fat White Woman," in which the wife of a cruel headmaster of a shoddy cram school for boys, cannot prevent a tragedy, sunk as she is in the deadweight of a damaged ego, and her revenge is a mad oration to which no one will ever listen. Perhaps the regional flavor of Trevor's work has delayed his full recognition here -- but possibly the Mary Lavin audience, for example, will join him.